While running some biblical references yesterday I came across a text in Song of Solomon 8:6: “Set me like a cylinder seal over your heart, like a signet on your arm. For love is as strong as death, passion is as unrelenting as Sheol. Its flames burst forth, it is a blazing flame” (NET Bible). In the ancient Near East (khotam “seal”) was used to denote ownership and was thus very valuable (Jer 22:24; Hag 2:23; Eccl 17:22). Seals were used to make a stamp impression to identify the object as the property of the seal’s owner (HALOT 300). Seals were made of semi-precious stone upon which was engraved a unique design and an inscription, e.g., LMLK [PN] “belonging to king […].” The impression could be placed upon wet clay of a jar or on a writing tablet by rolling the seal across the clay. Because it was a valuable possession its owner would take careful precautions to not lose it and would keep it close to him at all times. 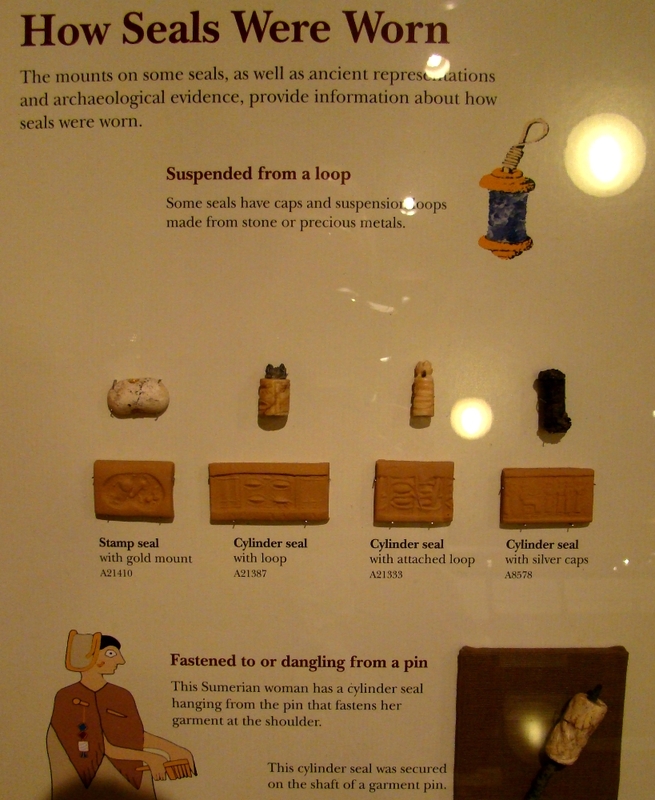 The Oriental Institute Museum of the University of Chicago has some helpful displays of ancient seals, how they were made, how worn, along with several examples of actual seals and their imprints. How Seals Were Made. Oriental Museum Chicago. Photo by Leon Mauldin. Seals, How Worn. Oriental Institute. Photo by Leon Mauldin. Note that this above display shows both the stamp seal as well as cylinder seal. The Hebrew word for seal, khotam or chotham, occurs twice in our text, characteristic of the parallelism of Hebrew poetry. The NET Bible renders the same word khotam as cylinder seal and then signet in the verse (Song of Solomon 8:6). There were two kinds of cylinder seals in the ancient Near East, namely, those worn around one’s neck and those worn around one’s wrist. The typical Mesopotamian seal was mounted on a pin and hung on a string or necklace around one’s neck. 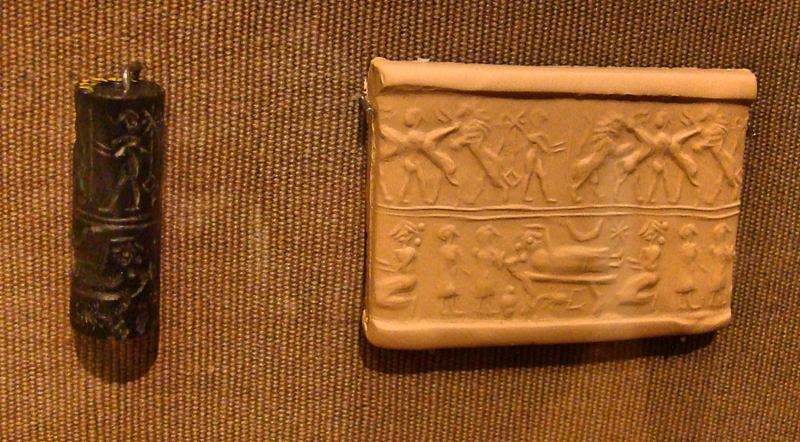 The cylinder seal hung around one’s neck would, figuratively speaking, rest over the heart (metonymy of association). The Beloved wished to be to Solomon like a cylinder seal worn over his heart. She wanted to be as intimate with her lover as the seal worn by him (W. W. Hallo, “‘As the Seal Upon Thy Heart’: Glyptic Roles in the Biblical World,” BRev 2 : 26). (NET notes). 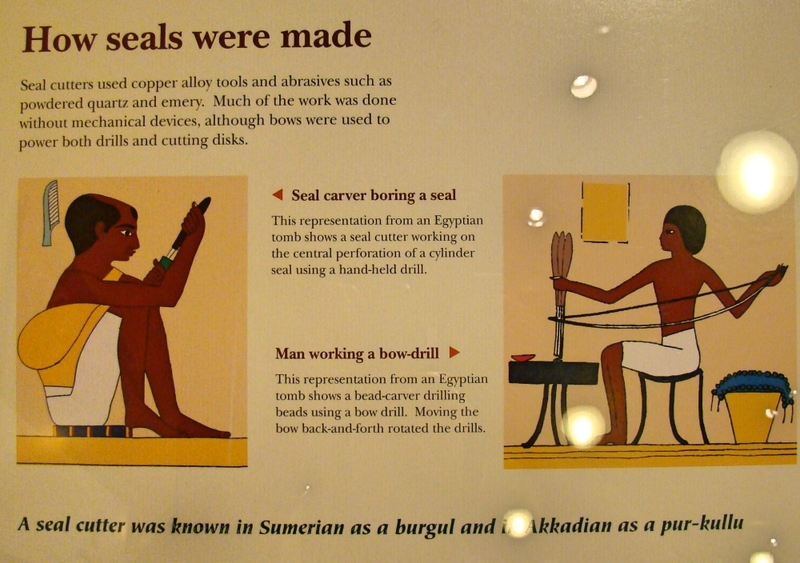 Seal on display, Oriental Institute. Photo by Leon Mauldin. This cylinder above has a contest scene at top and what may be a childbirth scene at bottom. Ancient seal Oriental Institute. Photo by Leon Mauldin. This seal is dated at 2,900-2,750 BC according to its accompanying placard. Literally “cylinder-seal” or “seal.” The term (khotam, “cylinder-seal”) is repeated in Sol 8:6 for emphasis. The translation above uses the terms “cylinder seal” and “signet” simply for the sake of poetic variation. The Beloved wanted to be as safe and secure as a cylinder seal worn on the arm or around the neck, hanging down over the heart. She also wanted to be placed on his heart (emotions), like the impression of a cylinder seal is written on a document. She wanted to be “written” on his heart like the impression of a cylinder seal, and kept secure in his love as a signet ring is worn around his arm/hand to keep it safe. (NET notes). Alternately, “wrist.” In Palestine cylinder seals were often hung on a bracelet worn around one’s wrist. The cylinder seal was mounted on a pin hanging from a bracelet. The cylinder seal in view in Song 8:6 could be a stamp seal hung from a bracelet of a type known from excavations in Israel. (NET notes). This entry was posted on Friday, July 17th, 2015 at 10:56 AM and is filed under Archaeology, Bible History and Geography, Biblical Interpretation, Old Testament, photography, Travel. You can follow any responses to this entry through the RSS 2.0 feed. You can leave a response, or trackback from your own site.